Following the open call for submissions in June this year, we are pleased to announce the winning projects of the Unpleasant Design Competition! After a long thought, the jury decided to award to equal first prizes to the projects “SI 8 DO – Social integration furniture Sevilla” by (bau)m_arquitectura and “FREE WILL” by Marko Tirnanic. The two winning projects show a strong conceptual idea and were executed very solidly, even though they have a very different approach to the theme. The third prize goes to Ankita Thaker for her project “Maze door lock”. Please read below for an update on the story of the third prize! by BAUM LAB Architecture: Marta Barrera, Javier Caro and Miguel Gentil. SI8DO is a social-integration urban furniture, a subversive urban-intervention tool designed to improve the working conditions of those people that work at the traffic lights selling tissues. After months of fieldwork, more than a hundred immigrants were located at Seville’s crossroads. Unfortunately most of them spend the whole day standing. 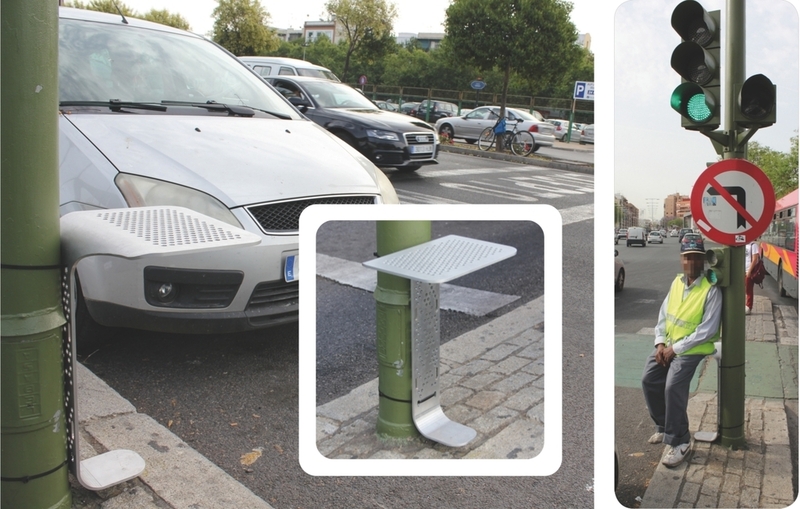 Attached as a parasite to traffic lights, a simple, folded, perforated metal sheet creates both the seat and the storage shelf they need to work more comfortable. SI8DO not only highlights an unfair urban situation, but also proposes a solution. The first prototype is now fabricated and tested. Here we present the results. Some tissues companies are interested in supporting the idea. With this work I wanted to provoke thoughts on the idea of free will and possible “free spaces”, freed from control of the state and proscribed moral norms. This work was produced on a location under video surveillance – CCTV – and it has two interrelated components. One is a security camera recording and the second is a photo that reveals another angle -within the scope of CCTV but hidden from the surveillance camera. Within this uncovered, uncontrolled and free space we shot with fifteen people trying to fill the space invisible to the camera, thus breaching the ethical norm and intention of controlling space with a camera lens. By highlighting uncontrolled public space, in the form of triangle, I wanted to emphasize trust and fear, conditionality and spontaneity, as well as other contradictions produced by two different lenses from the video and photo cameras.The two can be also seen as different perspectives that the observer could take and it could make the observer reach two different conclusions – either that the space is free of people or that people use the space. Moreover, there is a need for space that is utilised as a Social vent, contrary to the Orvel-Haksley dystopian scenario. After the publication of our book, it came to our attention that the third prize “Maze door lock” was misrepresented as original work from Lebedev’s Defendius April’s joke, dated back from April 01 2008.